This weekend Canada witnessed a despicable act of terrorism perpetrated against Muslims in Canada. While individuals, including children, were praying in Quebec City’s Centre Culturel Islamique de Quebec a gunman entered the space and opened fire. As a result, six people are dead and more remain in critical condition. The BCCLA grieves the loss of Mamadou Tanou Barry, 42, Abdelkrim Hassane, 41, Khaled Belkacemi, 60, Aboubaker Thabti, 44, Azzeddine Soufiane, 57, and Ibrahima Barry, 39. Our thoughts are with their loved ones. 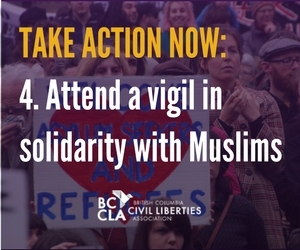 As we mourn this horrific incidence of mass murder, we want Muslims in BC to know that if they are faced with violence or discrimination for being Muslim (or perceived to be Muslim), there are resources out there. 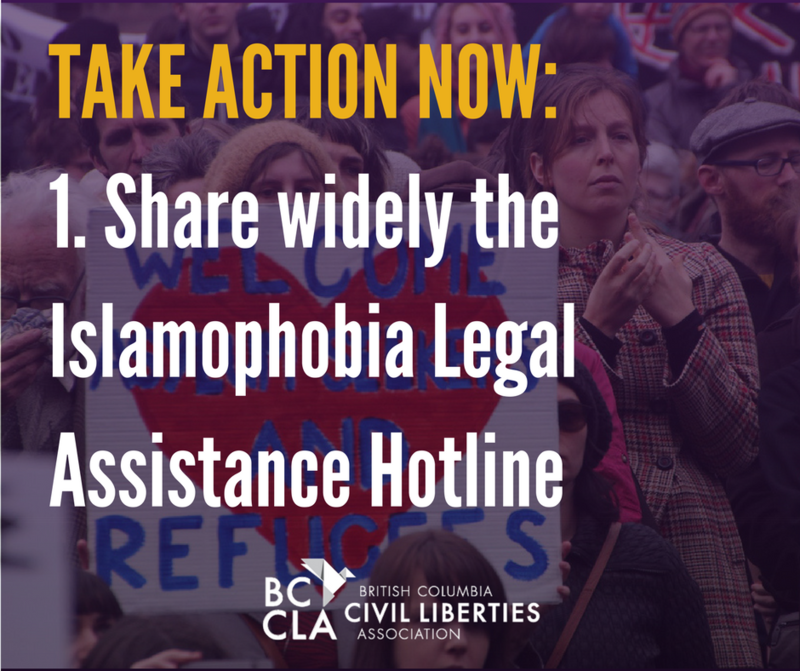 In March of 2016, the BCCLA joined with a coalition to launch a resource phone line in BC providing free confidential legal advice to people who have been discriminated against, harassed, or faced violence because they are Muslim or are perceived to be Muslim. If you are in need of this kind of resource, please find more information about the Islamophobia Legal Assistance hotline here. This national tragedy came amidst the chaos created by an Executive Order issued by US President Trump. The order bans all citizens of Iraq, Syria, Iran, Libya, Somalia, Sudan and Yemen from entering the US for 90 days, stops the admission of all refugees to the United States for 120 days, and bans entry of those fleeing from war-torn Syria indefinitely. The BCCLA deplores this racially discriminatory order , which has disrupted lives and torn apart families. While the government of Canada says that the U.S. government has clarified that Canadian citizens who are dual citizens of the listed countries are not covered by the ban, it is totally unclear how border authorities will actually apply the order to individuals when they try to enter the U.S. Already, there are indications that border officers are refusing to follow a court order putting a halt to removals of individuals under the order, and it is clear that officials have been totally confused by what the order actually means. (You can find our latest updates on Canadians and the US Travel Ban here). In response to this order we join many other civil society and refugee-serving organizations in calling on the Government of Canada to suspend the “Safe Third Country” agreement with the United States. The agreement allows Canada to turn away most refugee claimants who are transiting through the United States to Canada via the land border, based on the premise that the United States is a safe country in which they can make their asylum claim. If Canada ships refugee claimants back to the United States, the United States has made clear that it will refuse their claims. Sending asylum-seekers back to the U.S. will put Canada in breach of its legal obligations under the Refugee Convention. Canada cannot respect international law and continue in this agreement with the United States at the same time. We call on the federal government to suspend the Safe Third Country agreement effective immediately. TONIGHT Parliament is having an emergency debate on the issue. 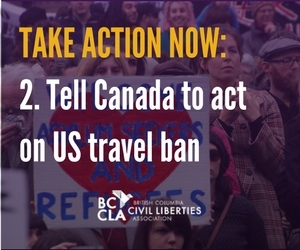 You can help by asking your MP to ensure Canada takes action on the US travel ban. Draft email content and calling scripts are available from our friends at the Canadian Civil Liberties Association here. 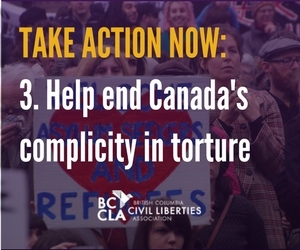 This week BCCLA joined with civil society groups from across the country to issue an open letter to the Public Safety Minister Ralph Goodale about the urgent need for Canada to revise the Ministerial Directives on torture. A decade ago, the public inquiry into the case of Maher Arar clearly documented that irresponsible sharing of intelligence information from and to Canada can and does result in torture. The inquiry into Mr. Arar’s torture explicit recommended that intelligence information should never be shared by Canadian agencies if it is likely to lead to torture. Canada’s Ministerial Directives issued in 2011 explicitly run counter to those recommendations. This week, the New York Times reported the United States administration is open to the return of torture during interrogations and is considering a review of its use of CIA black sites. Both these revelations raise troubling questions about the very real risk that intelligence sharing between our two countries may again become tainted by torture. You can help by calling on the Minister of Public Safety to revise the Ministerial Directives on torture issued by the previous government in 2011. End Canada’s complicity in torture. Canada must revoke the Ministerial Directives allowing for collaboration and information sharing with foreign government agencies if the information conveyed is derived from torture, or torture may result. Canada must pass a law to create a clear prohibition on sharing information likely to be derived from, or at risk of leading to, torture. Below is a list of more than 30 communities taking part in vigils to mourn the loss of life that resulted from this act of terrorism. We encourage everyone to attend or organize a vigil near you in solidarity with those who have lost loved ones and in repudiation of this act of hate and terror. Thank you to @hussansk for bringing this list of vigils together. If there is an action missing or you are organizing an action please reach out on twitter. Previous Post: Whose streets? Our streets!